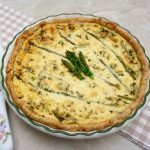 Asparagus Quiche is an easy recipe to make for the upcoming spring holidays. 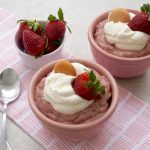 It is versatile and can be served for breakfast, brunch, lunch or even dinner! 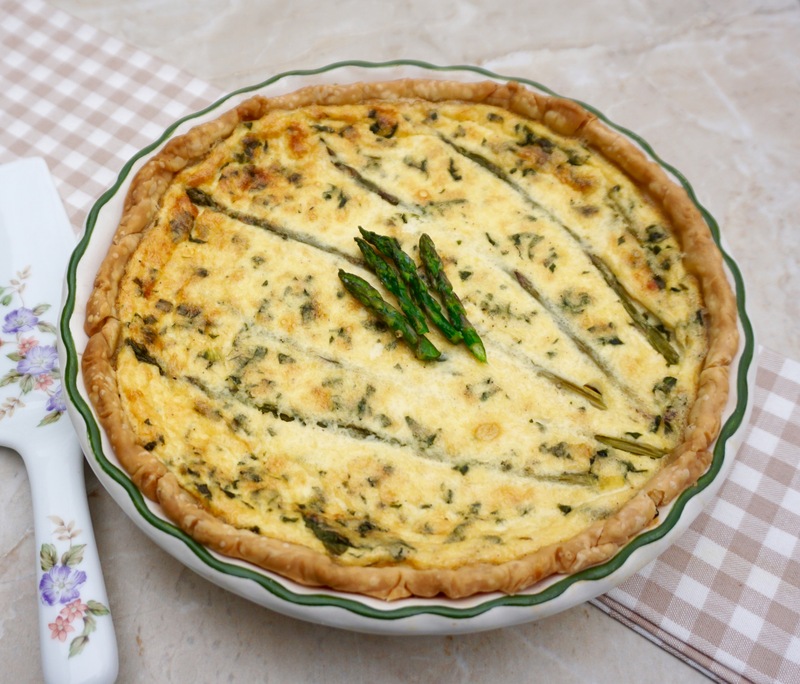 Quiche is a savory custard that is made with eggs, milk, and cream. It can be made with all kinds of different cheeses, meats and vegetables. Once you have the basic recipe, you can make it your own with your favorite ingredients. Quiche can be made ahead and reheated or even frozen. This is helpful if you are having a holiday brunch or Mother’s Day luncheon. Any part of the menu that can be prepared in advance takes pressure of you on the day of the event! 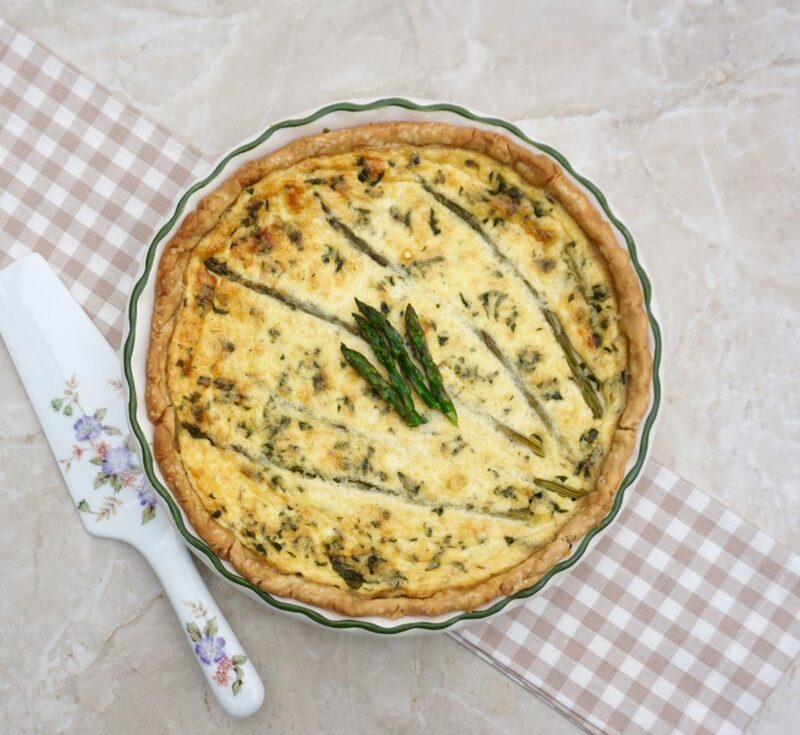 Asparagus Quiche features slim stalks of spring asparagus, fresh baby spinach and green onions. 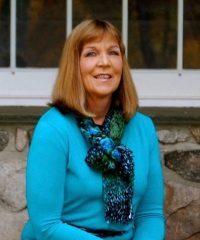 It would be great to serve if you are hosting an Easter Brunch or Mother’s Day luncheon. 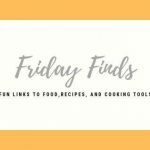 You can use a prepared pie crust for this recipe or make your own. Try Fool Proof Pie Dough if you want and freeze the other half of the dough to use later. Press your unbaked pie crust into a 9 inch pie plate, crimping the edges. There is no need to grease the pie plate. Melt the butter in a skillet over medium low heat. Add the sliced asparagus and cook, stirring for 2 minutes until the pieces become bright green and slightly softened. Add the green onions and cook for an additional minute. Add the spinach and cook until it is wilted. Remove from the pan and cool slightly. If you are going to add the asparagus spears to the top of your quiche, place them into the skillet, adding a touch more butter if needed. Cook them, turning occasionally for 2 minutes until they are bright green and slightly softened. In a medium bowl, beat the eggs then add in the cream and milk. Mix well. Add the swiss cheese, parmesan cheese, nutmeg, salt, pepper and cayenne. Mix well. Add the vegetables to the egg mixture and stir in thoroughly. Pour the egg mixture into the unbaked pie shell. 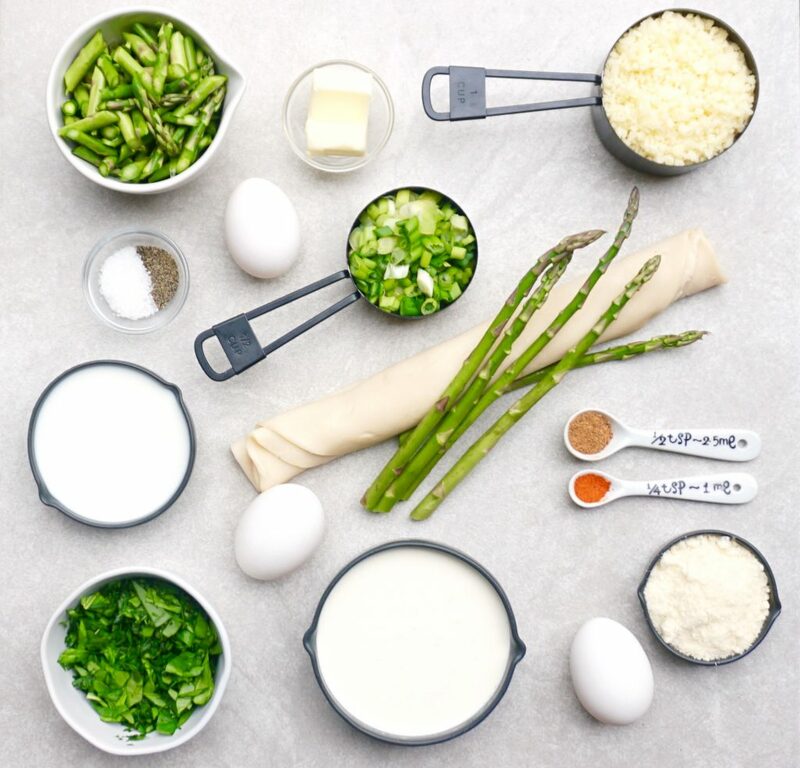 If you are adding the asparagus spears, lay them gently over the top of the quiche in a row. They will sink slightly! Bake for 40- 50 minutes until the quiche is completely set and lightly browned. Let sit for several minutes before cutting into wedges.